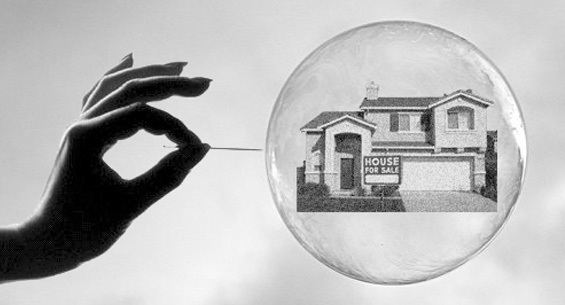 Recent economic events have brought the concept of financial bubbles from academic texts to the forefront of economic and commercial thought. Whereas economies used to be slow laborious creatures, the globalisation of capital markets, and growth of technology within them, has increased the ‘speed’ of economies to a pace never seen before. 3) The availability of liquidity (cash) to finance those transactions. In relatively slow-paced economies, these components work well, and usually generate ‘fair value’ equilibrium in the market. Once economies globalise, and their speed increases, the structure of bubbles becomes somewhat different, and can be seen in a three stage model. Real Assets: The perceived value of real-assets in the economy such as the underlying value of commodities, cash, equities, real-estate and so forth. Stage 1 – “Economically Neutral” – There is neither a positive nor negative sentiment in the economy, and assets are reflected at their natural price. Stage 2 – “Economic Optimism” – Economic output grows, sentiment moves to positive. The natural value of many assets (such as equities) grow as profits increase, and new money is created with reduced risk-perceptions based on future growth. 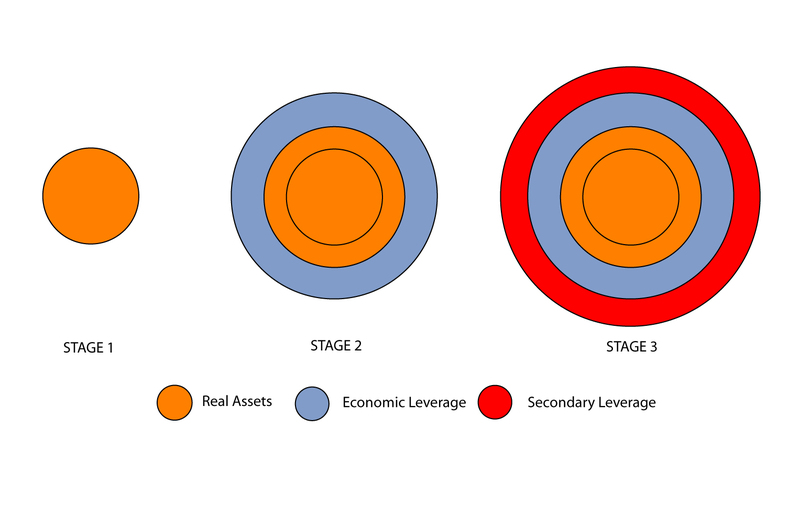 We see therefore that the ‘real asset’ bubble increases in size, and an economic leverage bubble is created (eventually into which the real-asset bubble will grow, as the valuation of assets being chased by capital will invariably grow to equal the capital available resulting in equilibrium). In a ‘slow’ economy, this is typically when the bubble bursts, and the affected asset’s price returns to a more ‘natural’ price, giving a gentle sinusoidal structure to economic growth. Stage 3 – “Irrational Optimism” – By this stage, the ‘real asset’ bubble has grown to encompass the entire size of the economy at ‘stage 2’. Economic leverage is still available, but around this, as the economy globalises and becomes more ‘sophisticated’ a new bubble forms. This bubble, the ‘secondary leverage’ bubble is created where already-levered assets and debt structures (such as mortgages, debt driven corporate transactions, overvalued equities etc) are used to create further new money (mortgage derivatives, credit derivatives, and so forth). This second bubble can grow immensely fast, and invariably creates the sharpest increase in the price of the underlying asset. Eventually, you will reach a stage where the availability and ratio of counterparties who are interested in acquiring/disposing of assets changes (fewer counterparties, those who exist usually wish to dispose not acquire) and the availability of liquidity (cash) to finance those transactions decreases (as the system is so stretched that no more new money can, in good faith, be created). In our new economy THIS is when the bubble bursts. The massive momentum built invariably creates a steeper and more precipitous collapse of prices across asset classes, meaning that non-commercial-actors in the market (central banks) have to create new money to slow the contraction of the bubble, and hopefully revive optimism. This macro-model of bubbles can exist for whole economies (as we have seen recently) but can also be seen on individual asset classes. Currently we see similar bubbles to the above forming in US Treasuries, energy commodities, precious metals and even some BRIC equities. Classic economic theory simply will not allow governments and regulatory bodies to deal with bubbles effectively, as they will grow to tremendous sizes immensely fast, meaning that the amount of support needed when they burst vastly exceeds the value of most economies. For example, in December 2007, Listed credit derivatives (secondary leverage) stood at USD 548 trillion (to put that in context, The GDP of the entire world is USD 50 trillion). On top of the listed credit derivatives, there was also an OTC (Over-The-Counter) derivatives bubble which had a notional (face) value of USD 596 trillion. Fundamentally, the real way to tackle bubble-formation is through careful understanding and regulation of how financial products are created and traded (not necessarily regulating the capital structure of the markets themselves). Regulating capital structures (with accords such as Basel) doesn’t prevent these bubbles, it simply encourages participants to find alternative methods to create ‘new money’ and alternatives ways to trade. The numbers involved also mean that these measures are very unlikely to prevent a catastrophic failure of the economy when it gets to “stage 3” (in our model above). Regulating the products themselves, however, can prevent the dangerous expansion of economies. Cynics may argue that this would hamper economic growth, but the truth is that it is the sinusoidal movement of economies between “stage 1” and “stage 2” which contributes to growth, while the participants in “stage 3” very rarely contribute to any ‘real economic growth’ as their entire theatre is virtual, and comprises a few powerful participants (investment banks) rather than the wider environment. We can only hope, therefore, that regulators and political actors begin to realise that our highly global and rapid economic environment requires a very different approach to regulation to control bubble formation.